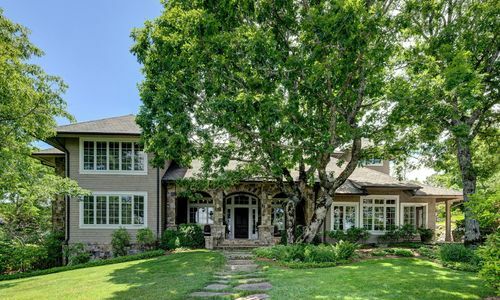 This Highlands NC home for sale is a stunning home in the Highlands Country Club. 370 Upper Brushy Face Road is located on the plateau at the top of Highlands Country Club. The 6 bedroom, 5.5 bath home is situated on a lot that is .79 of an acre in size. The unsurpassed views are embraced by this Highlands NC home, inside and out. Approaching the home you are greeted by beautiful stone arches on the front porch. The large wood door is warm and inviting, opening into an elegant home. The living room boasts high, coffered ceilings and a stone fireplace with a magnificent carved custom mantle. The great room is a gathering place that everyone will enjoy. Here the focal point is the large two story stone fireplace. The cathedral wood ceiling is complete with a custom crafted antler chandelier. The wall of stone and glass doors leads onto a rear covered porch with stone flooring and another floor to ceiling stone fireplace. The home was created for entertaining. The great room has an over-sized custom entertaining bar in the corner of the room as well as easy access to the kitchen. The kitchen includes a large walk-in pantry and wood island with seating for guests, perfect for conversations. The dining room is spacious and has a wall of windows that capitalize on the home’s stunning setting. The home has 6 bedrooms and five and a half baths. Two of the bedrooms are gracious master suites that include stunning spa styled baths and private sitting rooms. There is plenty of room for a large family. In addition your guests will be comfortable. The outside spaces of this Highlands NC home for sale are fabulous. The landscaping is beautiful and the stone porches and terrace offer inviting spaces to spend time entertaining or relaxing. These outdoor spaces offer spectacular views, including amazing panoramic views across Blue Valley from the rear covered porch. The stone terrace on the side of the home has an outdoor kitchen, hidden waterfall, and another stone fireplace, also great mountain views. In short, this home has it all. If you have been looking for a luxury home for sale in Highlands NC look no further. Schedule a private showing today and realize your dream of owning a vacation retreat in in the Southern Blue Ridge Mountains. Contact our team at Berkshire Hathaway HomeServices Meadows Mountain Realty today to learn more about 370 Upper Brushy Face Road. We welcome the opportunity to help you complete a successful Highlands NC property search while guiding you through the buying process. Let our knowledge and experience serve as your guide to the area, helping you locate the ideal Highlands NC home for sale for you and your family.